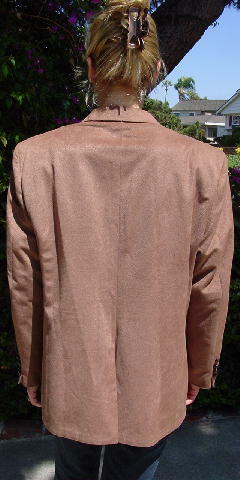 This vintage cocoa colored jacket is by John Blair. It has a nice golden-copper lining with two inner pockets. 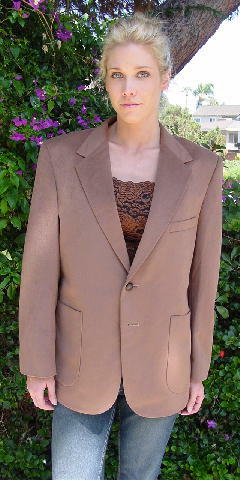 There are long lapels with a two brown (faux leather) button front closure, shoulder pads and 2 lower open front pockets and one breast pocket. The long sleeves have four buttons on each. It has nice soft fabric, that feels like a brushed cotton. There is no fabric tag. It's from a stylist's inventory, and was used for pictures for models' portfolios. shoulder pad to shoulder pad 19 1/4"
bottom hem side to side 23 1/2"